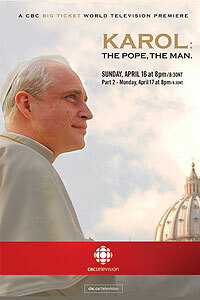 SYNOPSIS: A CBC two part event mini-series continues the story of the first man from behind the iron curtain to be elected Pope. Focusing on his Papacy and the tremendous impact he had on the church and the world. This is the true powerful story of a spiritual leader who helped bring down Communism and reached out to other religions and world leaders with a message of peace and love. Written and Directed by Giacomo Battiato, Starring Poitr Adamczyk, Adriana Asti. Leslie Ann Hope. Produced in co-production with Tao Due. SYNOPSIS: Karol Woityla is a boy of eighteen on the threshold of life as an actor, writer and poet when he sees his world shattered with the Nazi invasion of Poland in 1939. This CBC event mini-series follows his decision to become a priest and his struggles under the Nazi regime and later under communism, including the journey that would eventually lead him to Rome and the Papacy. Directed by Giacomo Battiato. Produced in co-production with Tao Due, Starring Poitr Adamczyk, Raul Bova, Hristo Shopov, Matt Craven, and Kenneth Welsh. SYNOPSIS: A two part event mini-series based on the Governor General award winning book, LIVES OF THE SAINTS by Nino Ricci. This saga tells the story of Vittorio Innocente and his mother Christina, whose affair with a blue-eyed stranger shatters the innocence of Vittorio’s childhood. As he pieces together the story of his mother’s past, Vittorio discovers the truths of the villagers and gains a new understanding into human nature. The tiny Italian village of Valle del Sole harbours century-old superstitions, fears, maliciousness, hypocrisy and a pagan past. The closer Vittorio comes to the truth about his mother, the more his discoveries threaten to tear apart his own world. 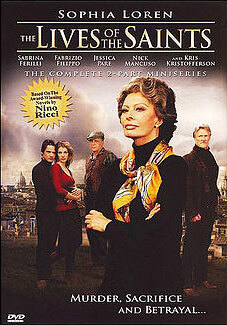 Produced as an international Canadian/Italian co-production for CTV and RTI starring Sophia Loren, Sabrina Ferilli, Kris Kristofferson, Nick Mancuso, Jessica Paré, and Fabrizio Fillipio.